In my last post, I examined American Airlines and their recent rebrand. 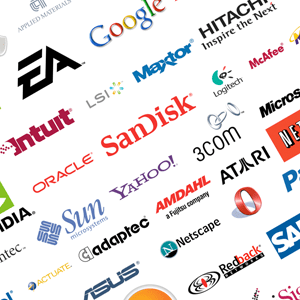 This week, we’ll be delving deeper into the world of branding – more specifically, logos. In this article, I will discuss what a logo is and what makes it great, how to design a professional logo and I will provide several resources for future logo design inspiration. Milton Glaser once said, “The logo is the gateway to the brand.” Glaser is the American graphic designer best known for the “I Love NY” logo, his 1975 Bob Dylan Greatest Hits poster, the logo used by DC Comics from 1977 to 2005, and the Brooklyn Brewery branding. I am mentioning Glaser here because I think that his definition of a logo is the best jumping off point for this article. A logo should represent every single aspect of your brand. It should evoke the very idea of what your company lives by. Think of some of the most well known brands in the world- FedEx, Nike, or Coca-Cola, for example – they are simple. They each consist of a single symbol, a distinctive typeface, or a combination of the two. This is intentional. Logos that are simple are often much easier to recognize and remember. This may seem obvious but I’d like to clarify here. Relevance does not just refer to the company the logo is being designed for. It seeps into every aspect of a logo- color, type choice, symbolism, etc. Don’t believe me? Let’s take a look at the Starbucks logo. Of course there is much more to this logo, but for the purposes of this demonstration, let’s simply change the color and see how the interpretation changes. Yikes! That doesn’t look like an ethically responsible coffee company! That looks borderline-satanic. While this is an extreme example, I am simply trying to make the following point: relevance is not just about your company, it is about every aspect of your company as well as the marketplace. Because our society associates red with danger, this would have been totally ineffective color pallet for Starbucks. For the record, this is something you should really never do with a logo. It is 100% against their branding guidelines. This is only for educational purposes. For more about Starbucks’ logo do’s and don’ts, see their branding manual. Designing a memorable logo goes hand in hand with the simplicity I mentioned in earlier. But what makes a logo truly memorable is the meaning behind it. Let’s take a look at the Google logo. Although you wouldn’t expect a search engine to evoke memories of childhood, Google has done just that. Using primary colors, with the exception of the green “l”, the logo depicts whimsy and adolescent curiosity. The slight slant on the “O”s also demonstrates playfulness. An effective logo will stand the test of time. Designing a logo that won’t go out of style relies mostly on resisting the urge to follow current trends. For example, 90s swooshes or beveled and embossed letters may appease your client today, but how will they look a year from now, or ten years from now? My first design class in college, like many designers, was Graphic Design I. Throughout the course I remember my teacher, professor Schuster, always reminding us to “make sure your design has legs.” At first, I had no idea what she meant, and envisioned my sketches growing limbs, jumping off my paper and walking straight out the door to lunch. This conclusion really wasn’t far off from what she meant. A design “has legs” when it can stand on its own two feet, no matter the medium. Your logo should be able to be translated effectively on business cards, in packaging, on a website, etc. Today, I find myself asking that very question- “does this concept have legs?” Thankfully, the answer is usually yes. But what is even more important are the ideas that come from constantly asking myself that question. Take a look at your logo. Does it work on a billboard? Yes? Great! Okay, look at it again. Does it work on a pencil eraser? No? Refine it. While a pencil eraser may seem like an extreme example, I’m really only trying to get you to test the limits of your design. When you shrink a logo that small, you start to notice things that really aren’t necessary. And, again, you can start getting ideas. For example, if your logo has a star symbol followed by the company name, you may find that the company name is no longer necessary. Perhaps the star is enough on its own. While this may not always be the case, it is a good way to brainstorm. Design in black and white. That’s right, I said it. Design your logos in black and white, at least at the beginning. If it doesn’t work without a color scheme, there is a good chance your design is too complicated. While designing a logo, you may be tempted to hide away in a corner and keep everyone waiting for the big reveal. A word of advice: don’t. Input from your team and your client can be beneficial. Try this experiment: Put your logo in front of one of your team members. Have them write down the first 5 words that come to mind. Nothing else. If this falls in line with what you were hoping for, keep going on that path. If not, speak with them and gain insight as to how the logo affected them. Work from there. In a recent article titled, The Design Process Is A Myth, YouTube designer Marc Hemeon, stated “a one-size-fits-all design process does not exist”. I agree. Individuals work in their own way, so the process I am about to suggest is one that has worked for me. You can use it as a rough outline in your future endeavors, or ignore it completely. In this step I speak with the client and gain understanding of who they are, what they want to accomplish, their content strategy, budget, timeline, etc. Once I have gained all of this information, I compile it into a single document and send it to them for review. This gives the client an opportunity to agree or disagree with the statements within the brief. Once it is approved, you can continue working. This is a crucial step because everything after this point should refer back to the design brief. If you start veering in another direction, refer back to the brief to stay on track. In my last article, I mentioned that the research phase should be about 95% of the actual design process. I feel very strongly about that. You need to have a complete understanding of what you are designing, why you are designing it, who you are designing for, etc. before you draw a single line. During this stage you should be researching competitors, gaining understanding of your client, examining other logos, learning from the design geniuses of our time, reading, and taking notes. With the research stage complete, it is time to pick up that pencil. Set up a block of time and just draw. Don’t stop. Put all of your ideas on paper. Draw until you can’t draw anymore. Take a break. Get some fresh air. Take a nap. Relax. It is often in this stage that you will find a whole new set of concepts. With your mind rested and batteries recharged, repeat step 3. Go back to the drawing board and sketch until you feel you have 2-3 truly concrete concepts to move forward with. Open ADOBE ILLUSTRATOR. Yes. That is right. I said Illustrator. In fact, I said it in all caps, which implies that I am yelling it. And I am. I am yelling at you because I am sick and tired of logos that are not in vector format. Stop creating logos in Photoshop. Learn Illustrator. Be a designer. Do your job. Alright, I feel a little better after that rant. But in all seriousness, please create your logos in a vector format. That way, you will be able to scale them as large or small as you want. As I discussed earlier, it is important to get a reaction from your team. See what they say about the logo, and work from there. Please note, that you are not in any way, shape, or form obligated to make every change that is suggested. In fact, I’d much rather you didn’t. You are the designer, use your best judgment. If you get a reaction like, “can’t you make it pop more?” follow it up further questioning. In the end, if this person is speaking just to hear the sound of his or her own voice, leave the logo as is. If they have a point, consider it. After you have gotten feedback from your team, and have made sufficient adjustments, present it to the client. The presentation of the logo is a crucial phase of the logo process. Clients are like small children, they often need to be led in one direction or another. This may sound a bit condescending, but it really shouldn’t. It is your job as a designer to help them understand your vision. With some clients, this is easier said than done. But it isn’t impossible, if you ask the right questions. Just finished up the logo! What do you think? I really don’t like blue. Can we make it bright yellow instead? Do you see what has happened here? We engaged the client in the wrong way. We asked what he/she thought. In reality, what he/she thought doesn’t matter in the slightest. What matters is how the target audience will receive the logo, or how it will communicate the company’s mission statement. But you didn’t ask those questions, did you? Now you have opened the floodgates to opinionated-client-hell. It is your job to defend your design and explain all of your decisions to the client. Design is intentional. Every decision you make as a designer should have an absolute reason. If it doesn’t, then you need to reconsider the design. Be prepared to answer any question that the client throws at you. Although this sounds a bit daunting, if you have really done your homework and continuously asked yourself questions throughout the entire process, it shouldn’t be a problem at all. Once you have discussed the logo at length, go back and check your work. Does the math add up? Is the logo consistent with the design brief? Refine your logo as necessary. Now that you understand what a logo is, why it is important, and what steps to take to design an effective logo, you may be in search of inspiration for your next project. Lucky for you, I have included a list of resources that will help you during the research phase of your next logo design. Does your logo need some love? Contact us today!